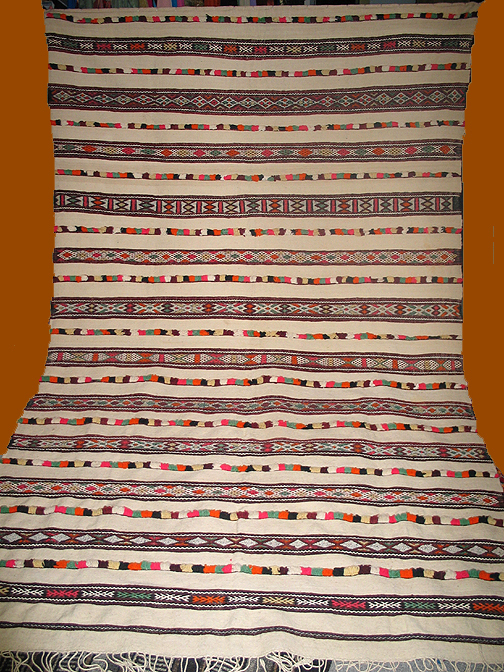 This wall hanging is handmade by The Amazigh (Berber) women from the Atlas Mountains of Morocco. It is handwoven primarily from wool with the addition of some decorative white cotton and spangles on some. This flatweave consist of traditional sets of patterns, delicately drawn geometric designs, zig-zag forms, and several motifs reminiscent of women's tattoos found throughout Berber art. It is very beautiful and can be used as wall hanging, bed cover, divider or a sofa cover. . It also makes and excellent décor item during a party especially when talking Moroccan themed events! Dry clean when needed. Unique piece and one of a kind!